Are Pakistan's Nukes in Safe Hands? There was certainly no remorse on Khan's part for his actions. "I will always be proud about what I did for Pakistan," Khan said. "I am obliged to answer only to my government, not to any foreigners," he continued, signaling that he will continue to resist attempts by officials from the U.S. and the International Atomic Energy Agency (IAEA) to interview him about his role in the world's biggest nuclear scandal. Last year, a United Nations nuclear watchdog said Khan's network was active in 12 countries. 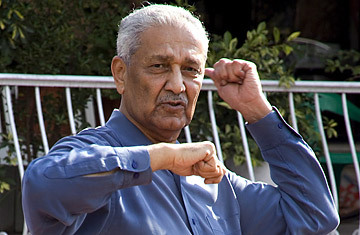 Khan was placed under house arrest in 2004 after he appeared on Pakistani state television to issue a teary-eyed confession. In that midnight appearance, speaking in English, he said he claimed sole responsibility for his actions. The next day, then President Musharraf pardoned the father of the country's nuclear program, citing his status as a national hero for establishing Pakistan as the first Muslim nuclear state and sparing him the indignity of a trial and imprisonment. Islamabad has since repeatedly rebuffed all calls from the IAEA and Washington to question Khan, saying that it has passed on all relevant information and considers the case closed. It is unclear what restrictions remain on Khan's movements. Henny Khan, the nuclear scientist's wife, told TIME that amid "happiness" and "disbelief," the family is still trying to establish what its newfound freedom means in practice. "This has come quite suddenly. Right up to the last minute, we were not expecting a favorable outcome," she said in a telephone interview. "We know that people who were not otherwise allowed in [to visit him] have now been allowed in." In his brief remarks earlier on Friday, Khan said that he was planning to go on a pilgrimage to Mecca. Khan's wife added that her husband will still be restricted in terms of what he can say. "We will not be able to issue any statements. This is part of an agreement that has been reached." Khan did not answer calls to his mobile phone. Whether that keeps him from actually speaking his mind is another thing. Khan has never let gag orders keep him silent for long. Indeed, over the past year, as Musharraf quit office and the new government eased in, the conditions of Khan's house arrest have steadily relaxed. Last year, he was allowed to meet friends, have relatives visit and even travel to Karachi amid tight security. Toward the end of Musharraf's rule, he sparked controversy after giving a slew of interviews in which he retracted his confession and claimed that he had been forced to read a statement handed to him. Khan also claimed that the army had colluded in at least one nuclear transaction  a charge Musharraf angrily denied. The Islamabad High Court swiftly muzzled him in July 2008, denying any future access to the media. But over recent months, he began writing a regular newspaper column, "Random Thoughts," a platform he has used to rail against Musharraf's campaign against militancy and to fondly recall decades past, when he had the ear of Pakistan's leaders. Despite what she believes are restrictions on his ability to speak out, his wife says Khan will continue to write his column. While many Pakistanis will cheer the court's decision, it has caused dismay in Washington. A U.S. State Department spokesman said the move was "extremely regrettable" and "unfortunate," adding that Washington believed Khan remains a "serious proliferation risk." Analysts believe that the court's decision could prove a source of embarrassment for the Pakistani government just days before Richard Holbrooke arrives in the region for his first visit as the Obama Administration's special envoy to Afghanistan and Pakistan. Last month, the U.S. State Department slapped sanctions on 13 individuals and three companies for their involvement with Khan's proliferation network. But outside his villa on Friday, in the shade of the Margalla Hills north of Islamabad, Khan was contemptuous of the anxiety his release is certain to trigger in the West. It is only public approval in Pakistan that he desires, Khan said, no doubt aware that he is still admired by broad sections of conservative and hard-line religious opinion for allowing Pakistan to match rival India's membership in the nuclear club. "Are they happy with our God? Are they happy with our prophet? Are they happy with our leader? Never," Khan said, adopting a wounded tone. "I don't care about the rest of the world. I care about my country. [President Barack] Obama cares about America, not about Pakistan or India or Afghanistan."